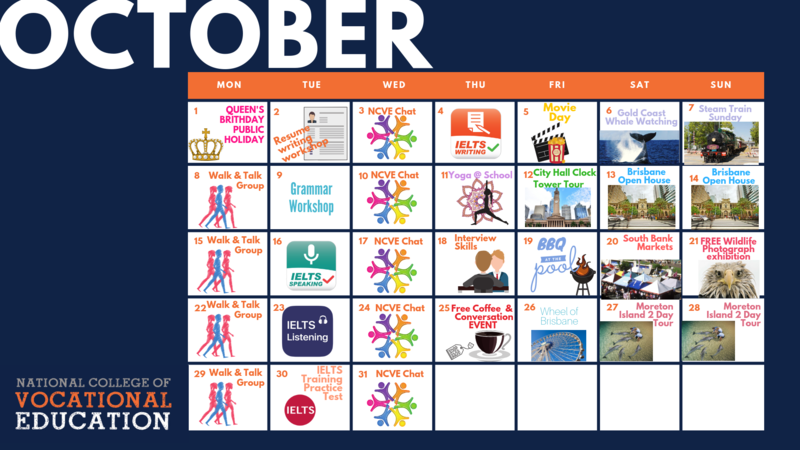 What’s On at NCVE International – we have just released our October 2018 Social Events calendar!! After the success of last month’s Coffee and Conversation Afternoon Tea event we will be hosting another FREE coffee & tea conversation event this month on the 25th October. The best news is that everyone is welcome to join and you don’t need to be a current student to join in – so bring your friends! Just come along, meet new people, and practice speaking English! Contact Tamia in our Student Support team for more information and to make bookings! This month we are also trialing a Yoga session for our students, so make sure you let us know what you think afterwards and if you want it added to our regular well-being program! What an exciting month ahead! For more information about our well-being programs while studying with National College of Vocational Education head to our Well-being Programs page under Studying with Us on our International School site.